On 8 June 2017, 20 EU Member States reached a political agreement on the establishment of a new European Public Prosecutor's Office (EPPO) under enhanced cooperation. Council Regulation (EU) 2017/1939 establishing the EPPO under enhanced cooperation was adopted by the JHA Council of 12 October 2017 and entered into force on 20 November 2017. On 1 August 2018, the Commission confirmed the Netherlands as the 21st EU Member State in the enhanced cooperation on the establishment of the EPPO (see for more information: Commission Decision(EU) 2018/1094 and press release). On 7 August 2018, the Commission confirmed Malta as the 22nd EU Member State in the enhanced cooperation on the establishment of the EPPO (see for more information: Commision Decision (EU) 2018/1103 and press release). Following a build-up phase of three years, the EPPO is envisaged to take up its functions by the end of 2020. 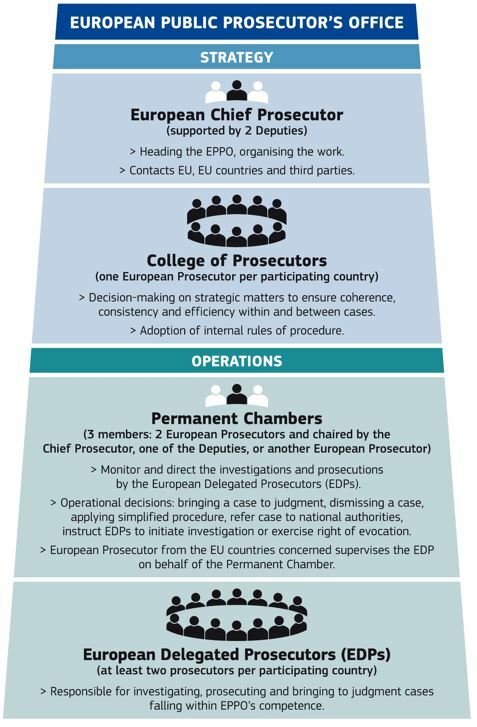 Important steps have already been taken to implement the Regulation establishing the EPPO, including implementing measures for the selection and appointment of the European Chief Prosecutor and European Prosecutors, the development of the Case Management System, and other logistical, administrative and financial matters. Following the adoption of two Council Decisions on the appointment of the members of the selection panel and its operating rules, the Vacancy Notice for the European Chief Prosecutor was published 19 November 2018 with the application deadline of 14 December 2018 (please see the Privacy Statement). The selection panel’s main task will be to draw up a shortlist of candidates for the position of European Chief Prosecutor and to assess the qualifications of candidates for European Prosecutors before their appointment by the Council. The EPPO will be an independent and decentralised prosecution office of the European Union, with the competence to investigate, prosecute and bring to judgment crimes against the EU budget, such as fraud, corruption or serious cross-border VAT fraud. Currently, only national authorities can investigate and prosecute fraud against the EU budget. But their powers stop at national borders. Existing EU-bodies such as Eurojust, Europol and the EU's anti-fraud office (OLAF) lack the necessary powers to carry out criminal investigations and prosecutions. The EPPO will operate as a single office across all participating Member States and will combine European and national law-enforcement efforts in a unified, seamless and efficient approach. The EPPO will be built on two levels: the central and the national level. The central level will consist of the European Chief Prosecutor, its two Deputies, 22 European Prosecutors (one per participating Member State), two of whom as Deputies for the European Chief Prosecutor and the Administrative Director. The decentralised level will consist of European Delegated Prosecutors who will be located in the participating Member States. The central level will supervise the investigations and prosecutions carried out at the national level. As a rule, it will be the European Delegated Prosecutors who will carry out the investigation and prosecution in their Member State. The rights of the suspects and accused persons will be guaranteed by comprehensive procedural safeguards based on existing EU and national law. The EPPO will ensure that its activities respect the rights guaranteed by the Charter of fundamental rights of the EU, including the right to fair trial and the right to defence. The procedural acts of the EPPO will be subject to judicial review by the national courts. The European Court of Justice – by way of preliminary rulings – has residual powers to ensure a consistent application of EU law. The EPPO will be the key actor to fight crimes against the EU budget, which is EU taxpayers' money. Temporary agents can apply until 26 April 2019 as administrative assistant.